In an unusually frank diplomatic move, South Korea pushed back against growing Chinese concerns about the deployment of U.S.-backed ballistic missile defense systems in South Korea. Without naming China, a spokesman for the South Korean Defense Ministry noted that other countries should keep out South Korean security policy debates. 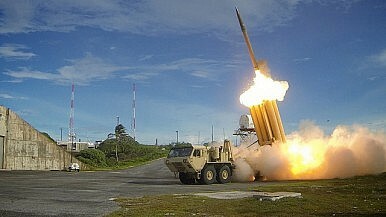 Kim Min-seok, the South Korean spokesman, noted that while “a neighboring country can have its own opinion on the possible deployment of the Thaad system here by the U.S. forces in South Korea … it should not try to influence our security policy.” Kim’s comments left little to the imagination with regard to which possible “neighboring country” he was referring to. China fired back, with its foreign ministry spokesman, Hong Lei, telling a press conference that “China’s position on the anti-missile issue is consistent and clear.” Hong continued to explained that the Chinese position was that “countries must neither pursue their own security interests at the expense of other’s nor undermine regional peace and stability.” “We hope that the relevant countries would be prudent in making this kind of decision,” returning Kim’s favor of not explicitly calling out South Korea. Today’s diplomatic exchange highlights the persistence of the Terminal High Altitude Area Defense (THAAD) batteries as a thorn in the China-South Korea bilateral relationship. From China’s perspective, THAAD represents a considerable threat to Chinese ballistic missiles which would theoretically come into play in a nuclear weapon use scenario. From a Chinese perspective, a U.S.-allied state operating a highly advanced anti-ballistic missile system, even if not directed explicitly at China, is an unacceptable security risk. China’s THAAD fears are thus based primarily on broader issues related to the competition between the United States and China for strategic primacy beyond the first island chain. As The Diplomat noted last fall, in combination with Japan’s deployment of a U.S. X-Band radar system, China perceives a trilateral defense network set up to counter its own capabilities. Hua Chunying, a spokesperson for the Chinese foreign ministry, described these actions by the United States, Japan, and South Korea as “unilateral security” measures, adding that they were “not beneficial.” Of course, given that the United States is simultaneously looking to “rebalance” militarily to Asia while letting South Korea and Japan take on a larger share of the burden for their own security, X-Band, THAAD, and other initiatives, including Aegis proliferation, are entirely in line with U.S. strategic objectives. South Korea’s interest in THAAD is primarily driven by the defensive benefits offered against North Korean ballistic missiles. In any hypothetical all-out war scenario between the two Koreas, Seoul would be faced with the prospect of countering massive missile and artillery barrages from the North. THAAD and other similar systems will provide an important bulwark against that threat. South Korea is additionally investing its own resources in developing a Korea Air and Missile Defense (KAMD) system and a “Kill Chain” preemptive strike system.